This post is sponsored by Happy Planet as part of their Soup Season campaign. Imagelicious received compensation and product for this post, however all opinions are my own. 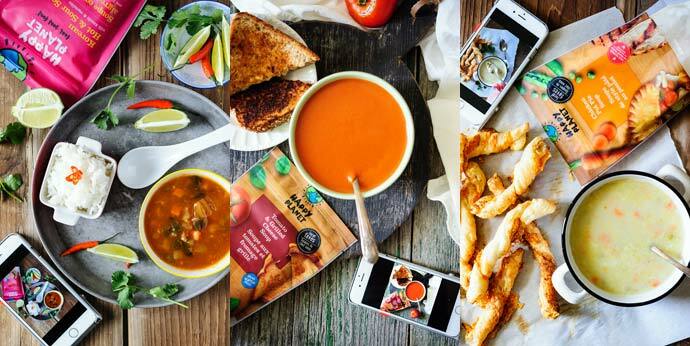 Three ways to soup up your lunch when time is luxury with Happy Planet soups. I used to be all about cooking from scratch. There’s nothing wrong with using shortcuts but I just loved the sense of accomplishment when I baked bread or made spreads and dips or even made cheese (yep, I made mozzarella once!). Yet if I am honest with myself even before the baby when I kept saying that I cooked from scratch I wasn’t. I bought hummus and bread and roasted peppers even though I knew how to make them all. Now I am making peace with buying more prepackaged foods. I bought this delicious guacamole from Costco and had it with homemade pita chips. I purchased cooked beets and made salad with them. So, to me it’s all about the balancing act of using good quality prepackaged and premade food and pairing it with something homemade or using it to prepare something else. And today I am writing about three ways to soup up your lunch when time is luxury. I mentioned in my last few posts that time is a luxury now. I actually have time since baby is still young and sleeps a lot but it takes a while to feed her, change her, rock her to sleep and by the time it’s all done I only have between 45 minutes to maximum an hour and half of free time. And I never know what it’ll be. And quite often she also decides to sleep on my arms. Since I am breastfeeding it means that I can’t eat just eggs and carbs (my favourite foods now), I need to put vitamins and nutrients and wholesome ingredients into my body so that I could provide them to my baby. 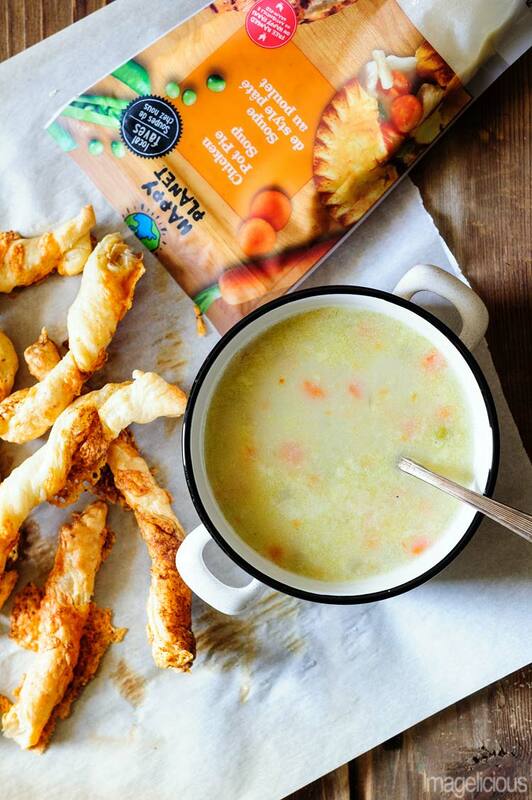 That’s where these delicious new soup flavours from Happy Planet come in. They are made with all natural ingredients and without any preservatives or artificial colourings. They are also made by a Canadian company and I love supporting Canadian businesses. Soups come in resealable pouches of 500 ml, although I usually eat the whole package. Not only they are absolutely delicious but also healthy and low in calories. As I said earlier I like adding homemade touch to premade foods, even if it’s something as easy as rice or sandwich. It makes me feel happy and productive. So, for lunches over the past couple weeks I pared three delicious and healthy Happy Planet soups with something to make a filling, delicious, easy and fast meal. Here are three ways to soup up your lunch when time is luxury. 1. Let’s start with Korean Hot & Sour Soup. It’s wonderfully spicy and sour from the addition of kimchi. It’s also chock full of vegetables and flavour. I cooked some rice earlier in the day which only takes about 2 minutes of active “cooking” – fill your electric kettle with water and bring to boil, to a pot add one part of rice and two parts of boiling water, cover with lid and bring to boil, turn off the heat and let the water absorb. If rice is left on the stove then it doesn’t even need to be reheated for lunch. Just add a few big spoonfuls of rice to the soup, squeeze some lime for extra tang, add cilantro (or parsley) and enjoy this filling lunch. Added bonus – it’s vegan and only 110 calories per cup. 2. Tomato soup and grilled cheese sandwich is a classic combination . 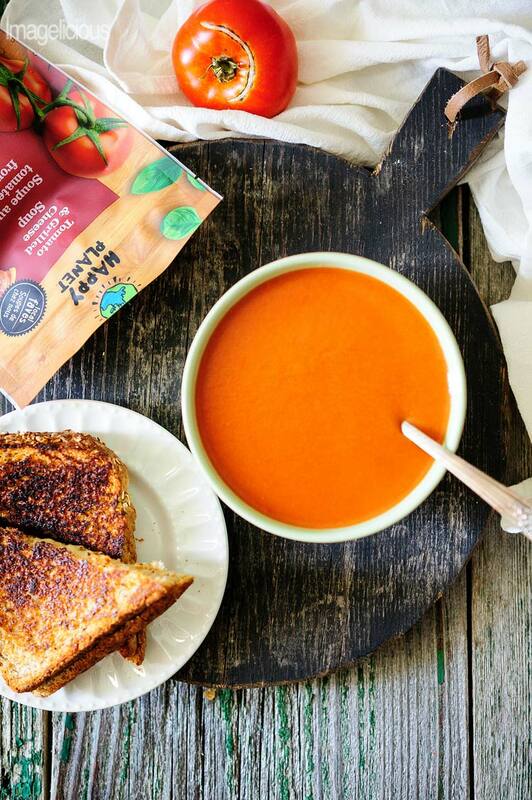 These flavours are combined in the smooth, creamy, and gluten-free Tomato & Grilled Cheese Soup. I love how silky smooth and luscious the soup is, it means that I can drink it fast from a cup instead of using a spoon which is a plus when there’s a screaming baby by my side. To make this into a filling lunch I wasn’t really original, I just made a simple yet delicious grilled cheese sandwich. My trick to the grilled cheese is that I spread the bread with mayo instead of butter, it reminds me a little bit of savoury French toast due to all the eggs in the mayo. To keep this lunch gluten-free you can use your favourite gluten-free bread for the sandwich in addition to the gluten-free soup. 3. Chicken Pot Pie is an ultimate comfort food – succulent chicken, creamy sauce, healthy peas and carrots, and, of course, the crust. Am I the only one who saves the crust for last? It’s always my favourite! So, I knew right away that I wanted to mimic the traditional Chicken Pot Pie when I had Happy Planet’s Chicken Pot Pie Soup. Perhaps this is the most involved out of the three lunches but it still takes less than 30 minutes to make which includes baking, but you need to remember to take puff pastry out of the freezer and put in the fridge a night before. To make the Cheesy Twists preheat the oven to 350F. Shred some cheese, any melty cheese or use pre-shredded, you’ll need about half a cup. Unroll one sheet of puff pastry and roll it a bit with a rolling pin to make it thinner, sprinkle paprika (regular, hot, or smoked) over the dough, cut the rectangle in half lengthwise and then in 8-10 crosswise to make between 16 to 20 small thin rectangles. Sprinkle the cheese on top, pat it so that it sticks to the dough, pick up each strip and twist in opposite direction to create twists. Cheese will fall out, don’t worry, just sprinkle it over the twists. Place them on a parchment covered baking sheet a couple of inches apart and bake for 15-18 minutes until puffed up and golden. These twists are perfect with the soup which tastes exactly like Chicken Pot Pie filled with tender, organic, free-range chicken from Kawartha Lakes in Ontario and delicious vegetables. So, here you have it. Three ways to soup up your lunch when time is luxury.You don’t have to compromise on taste when you have no time to prepare a healthy lunch, these Happy Planet soups have you covered and with a few extra minutes and ingredients your lunches will be transformed into a gourmet affair. Haha 🙂 I know. Lives are getting more and more complicated and busy and good lunch is hard to justify. I have actually eaten these soups (yup I know…I have time issues too sometimes). This is the perfect way to use pre-packaged foods…but make it your own. Love the idea and it sure beats takeout!! Thank you, Gloria. 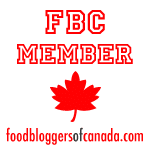 Have you tried their Fraser Valley Mushroom & mascarpone soup? That one intrigues me. Which other soup would you recommend I try? I always see this in stores but I have not gotten around to trying them. I am loving that tomato soup though. I will hunt it down this weekend! Wow, I’ve never seen any of these Happy Planet soups! I NEED to find that Hot & Sour soup, it looks delicious. I love your accompaniments, much more inspired than my typical bun or crackers. I am not a vegan, but I love cooking and baking vegan on occasion and that Hot & Sour soup was my favourite out of the ones I tried. Same for my husband. I agree, especially when the weather is getting cold and rainy. I am all for using healthy convenience foods. Who couldn’t use a little more time back in their day? I know I could! These soups look wonderful – especially that Hot & Sour Soup – so yum! 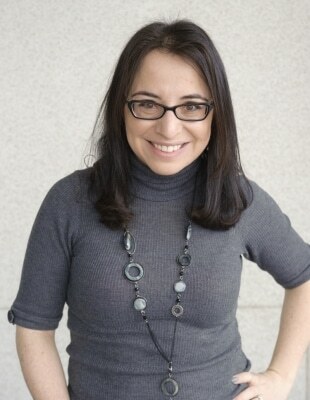 Thank you, Jenn. 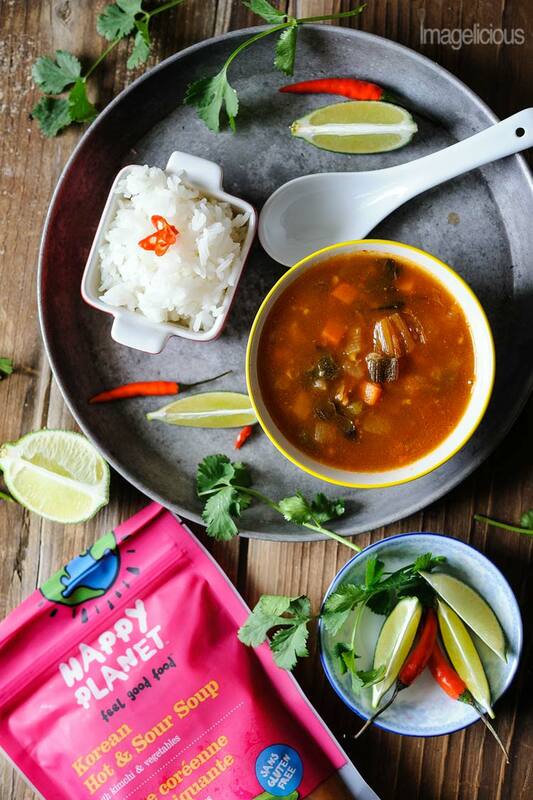 After reading more about Happy Planet I feel really good eating these soups – so easy and so convenient. A grilled cheese sandwich is a must with tomato soup. It just makes it more of a comforting meal. 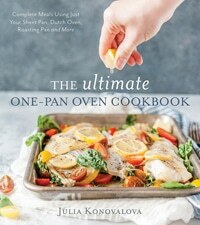 Julia — you taught me something new … I’ve never tried your method for cooking rice and now can’t wait to try it! Glad to hear you are getting a little more "me" time which makes for better "mom" time! That’s the only way I know of how to cook rice 🙂 It’s either a rice cooker or this way. Is there another way?